Shipton Court, in Shipton under Wychwood, in deepest Oxfordshire, is an impressive Jacobean mansion that dates from 1603, part of which is still lived in, and part of which has now been converted into flats. I first became aware of it, and its possible association with James Pulham, via a letter that arrived completely out of the blue. It came from a lady who had lived in Shipton Court for eighteen years, and had become involved with the Wychwoods Local History Society. During her investigations into the history of the Court, she unearthed a collection of six photographs of the gardens that date from the 1920s. Five of them were embossed in the lower right corner with the name of ‘Pulham and Son, 71 Newman Street, London and Broxbourne’. She and her husband had always assumed that this must be the name of the photographer, but they recently had a visit from Dr Timothy Mowl – Reader in Architectural and Garden History in the History of Art Department of Bristol University – who explained that Pulhams were a firm of landscape gardeners, and would not have had their name attached to the pictures unless they had been responsible for the construction of the gardens. Some of the pictures are shown here in Figs 1 to 4, and the embossed marks are clearly visible in Figs 1 to 3. This new information prompted her to look up ‘Pulham’ on the Internet, as a result of which she found my website, and decided to contact me. I visited Shipton Court in 2006, and was able to confirm that this was indeed a Pulham garden. In fact, it is very similar in style to the garden at Dutton Homestall, East Grinstead, Sussex, but on a larger and grander scale. 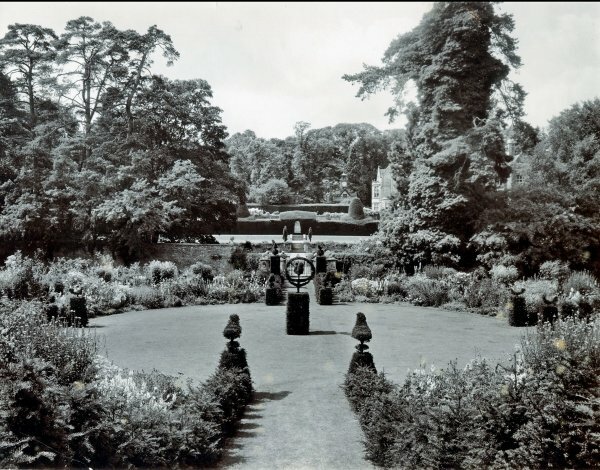 A walk around the gardens revealed that they are almost identical now to the way they were at the time of their construction, which I estimate to have been c1919-20. 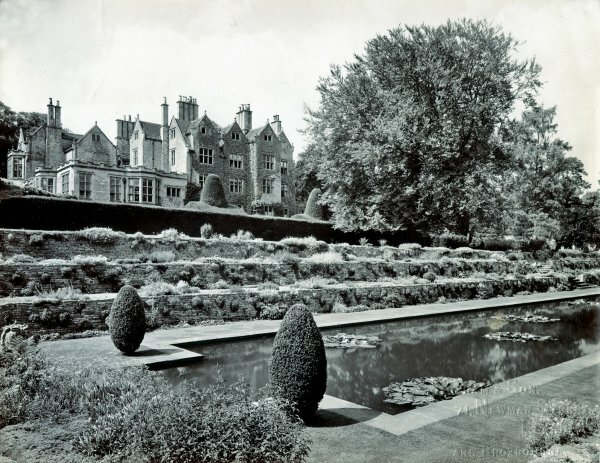 Shipton Court was purchased by John Graeme Thomson, from Alloa, in Scotland, in 1919. 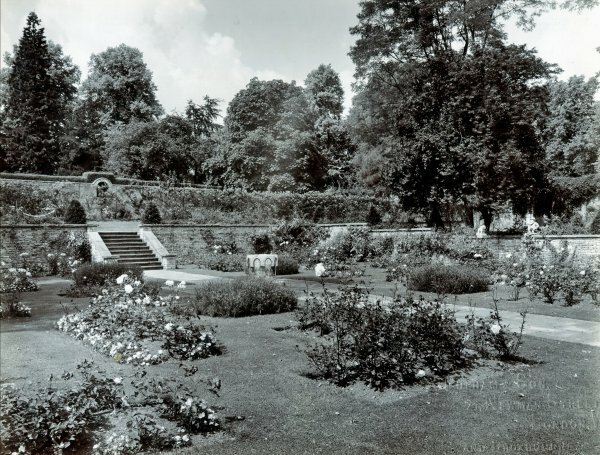 He moved his family south because of his failing health, and, despite suffering from asthma, he was a keen gardener, and wanted the garden terraced so that he could work without bending down[i] – the terracing along one side of the Lily Pool can be clearly seen in Fig 1. There are actually two pools, placed end to end in the valley that runs through the grounds alongside the house, and the smaller pool was used as a swimming pool during the 1960s and ‘70s. Fig 6 – The small pool in the terraced garden in 2006 – it used to be a swimming pool during the 1960s and ‘70s. 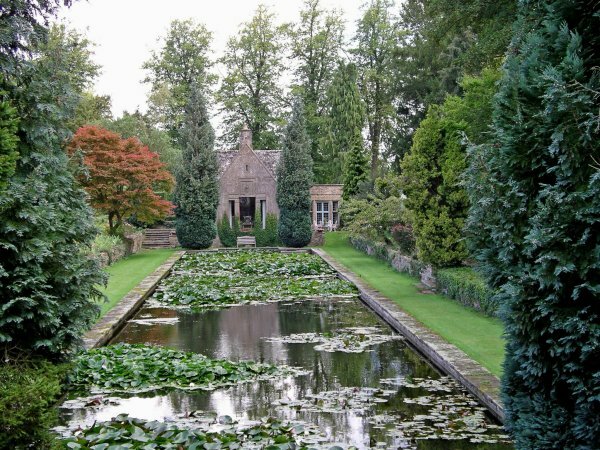 The house at the far end of this pool is known as Mere Folly, and was built to mirror The Summer House. John Thomson died in 1929, and Shipton Court changed hands three times between then and 1977, when half of it was sold off for conversion into flats, and buildings in other parts of the grounds were sold separately. 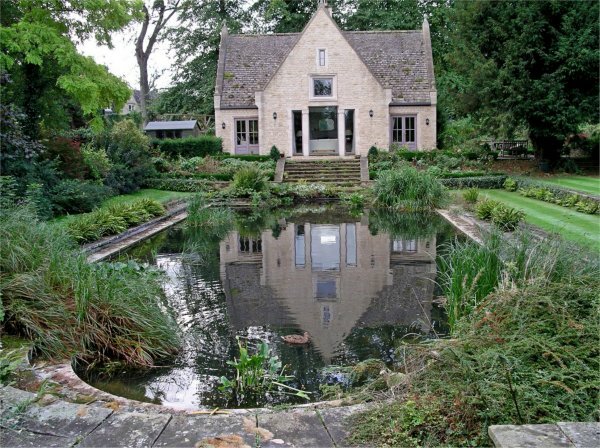 The small house at the far end of the large Lily Pool (in Fig 5) used to serve as a Catholic chapel during the 1950s and ‘60s, and many Shiptonians were married there and had their children christened there – it still has some stained glass panels in situ. This is now called ‘The Summer House’, while the newer house at the opposite end of the old swimming pool is a mirror construction called ‘Mere Folly’. Fortunately, the total entity of the gardens has remained intact over the years. All the owners of the flats and estate houses assume a joint responsibility for the maintenance of their own section, with the happy result that they can all still enjoy the whole gardens. Figs 5 and 6 show the two pools as they were at the time of my visit. 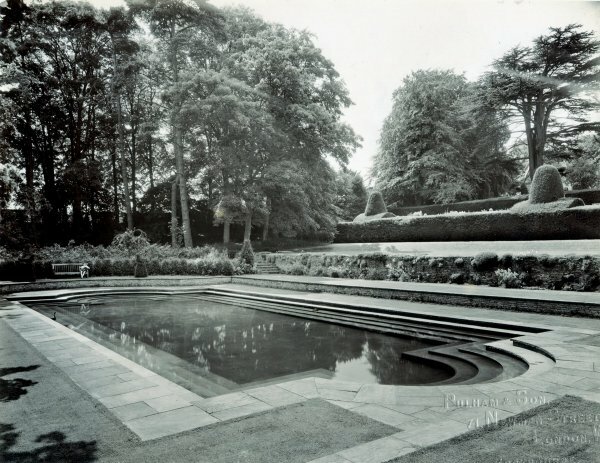 Posted on November 1, 2012 June 4, 2016 by Claude HitchingPosted in Sites Month 2Tagged . . James Pulham and Son, John Thomson, Lily Pool, Shipton Court, swimming pool, terrace.